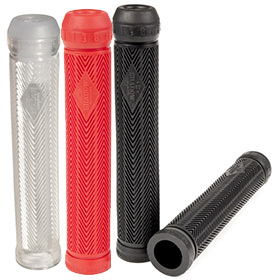 The Cult Faith grips are made by ODI in the the USA from soft Krayton rubber. The grips feature a fl..
After wearing vans for most of our lives, we wanted to see if the vans waffle pattern would work as .. Tidal Grip The Tidal grip comes in at 160mm and is available in Black, Gum and Army Green. Altern..
Tom Dugan’s signature grip features a timeless coil pattern, along with a feather design across th..
Primo Boy BMX GripsThe Primo Boy BMX Grips, are Anthony "Boy" Flores signature grips that feature a .. The Primo Cali Grip is Michael Harkous' signature grip featuring a thick ribbed pattern to give an e..
Primo signature grips for pro rider Kurtis Elwell. available in Black or Gray ..
Primo Ratima Grips - Jackson Ratima signature grips.Length: Long for those brakeless rider..
Classic V design grip from Primo, soft rubber compound. ..
Mushroom style design with cuts. Smoothen increase diameter on edges. 155mm. long &..
Lahsaan Kozba signature grip Spiral rib pattern Medium circumference / 144mm length Soft 25 du..
Simone Barraco is very particular about the parts he rides. When we started this project, he had a v.. Shadow Conspiracy / BMX - Guttural GripsSPECS:STYLE: Standard slip on, soft thin thickness, square m..
We were approached by Joris a couple of years ago with an interesting grip concept that immediately ..
Byron Anderson is an OG Shadow rider and product designer extraordinaire. Back in the day he designe.. The Eric L. Grip features a thin almost mesh like pattern throughout the entire grip with small smoo.. The Stranger Piston Grip is Connor Keating's signature grip featuring a wavey ribbed pattern made fr.. The Quan Grip is Caleb Quanbeck's signature grip and features 165mm reversible length made of either..